Well, I've bought my slow cooker now. What if you try to make a casserole and you leave it on all day and it all drys out! The lid being on should stop most of that. Let us pray to the Lid gods my potatoes aren’t stuck to the bottom in an hour! I've got a Breville one, I brought it back from my MIL's flat when we cleared it three years ago. I only just got round to using it a few weeks ago. I have used some of the recipes on Katy Kicker's blog and find that it saves us time when the boys have football and just when I want to feel ahead of myself. Dont use it every day, but probably about two or thee times a week. Oh I absolutely love our slow cooker. Can get away with cheap cuts of meat as the slow cooker dissolves and fat and makes the meat lovely and tender. everything turned out ace! Very impressed! I used mine for lamb curry and vegetarian lasagne and both were nice. The lamb was so soft and melted in the mouth. I found a recipe to make your own yogurt which sounds fascinating... might give it a go for fun (we get through boat loads of yogurt in our house). I've not used my slow cooker yet. But so far it's made me £15 as the lady I got it from in feeegle chucked in a load of other stuff which I've started to sell on. Including a rather fetching pink suitcase which earned me the store mentioned £15. So I think slow cookers are the greatest thing ever! My top 3 things from a slow cooker are: chilli con carne (with frying steak instead of mince beef), pork carnitas, and jacket potatoes! So. I've had this slow cooker for a number of months and I have to say I am using it more than ever. I use it to cook our meat for the sunday roasts, I make, soups, chillis, curry in it as well. The ability to make 3 weeks worth of food in one cooking is very useful, good job we have an american fridge freezer so store all the stuff in the freezer though! I love preparing the food in the morning and just forgetting about until I'm ready. I made chicken curry yesterday and during the week we had a corned beef hash and a sausage casserole. 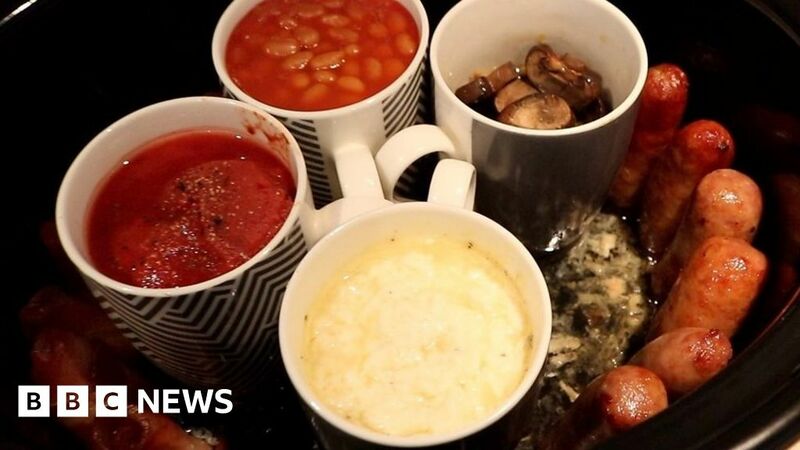 A recipe for a slow-cooked English breakfast has been shared tens of thousands of times online. Lot of washing up of mugs, nine hours of cooking surely it will only take 10 mins in the morning. I am unsure what they have achieved by doing it, a ten minute lay in maybe? BEAN there, tried that. Don't waste your £££s.